Continuing with my diversity holiday guide, I present to you: Middle Grade Books! Summary: Lupe Impala, El Chavo Flapjack, and Elirio Malaria love working with cars. You name it, they can fix it. But the team's favorite cars of all are lowriders—cars that hip and hop, dip and drop, go low and slow, bajito y suavecito. The stars align when a contest for the best car around offers a prize of a trunkful of cash—just what the team needs to open their own shop! ¡Ay chihuahua! What will it take to transform a junker into the best car in the universe? Striking, unparalleled art from debut illustrator Raul the Third recalls ballpoint-pen-and-Sharpie desk-drawn doodles, while the story is sketched with Spanish, inked with science facts, and colored with true friendship. With a glossary at the back to provide definitions for Spanish and science terms, this delightful book will educate and entertain in equal measure. Summary: Praised by the Horn Book as “both quiet and exhilarating,” this novel by the acclaimed poet and National Book Award Finalist Naomi Shihab Nye follows Aref Al-Amri as he says goodbye to everything and everyone he loves in his hometown of Muscat, Oman, as his family prepares to move to Ann Arbor, Michigan. This book was awarded a 2015 Middle East Book Award, was named a Notable Book by the American Library Association, and includes extra material by the author. Summary: When people look at George, they think they see a boy. But she knows she's not a boy. She knows she's a girl. George thinks she'll have to keep this a secret forever. Then her teacher announces that their class play is going to be Charlotte's Web. George really, really, REALLY wants to play Charlotte. But the teacher says she can't even try out for the part . . . because she's a boy. With the help of her best friend, Kelly, George comes up with a plan. Not just so she can be Charlotte -- but so everyone can know who she is, once and for all. Summary: A Choctaw boy tells the story of his tribe's removal from its Mississippi homeland, and how its exodus to the American West led him to become a ghost --one able to help those left behind. Summary: A magical coming-of-age story from Coretta Scott King honor author Jewell Parker Rhodes, rich with Southern folklore, friendship, family, fireflies and mermaids, plus an environmental twist. It's city-girl Maddy's first summer in the bayou, and she just falls in love with her new surroundings - the glimmering fireflies, the glorious landscape, and something else, deep within the water, that only she can see. Could it be a mermaid? As her grandmother shares wisdom about sayings and signs, Maddy realizes she may be the only sibling to carry on her family's magical legacy. And when a disastrous oil leak threatens the bayou, she knows she may also be the only one who can help. Does she have what it takes to be a hero? Jewell Parker Rhodes weaves a rich tale celebrating the magic within. Summary: Cassie Arroyo, an American studying in Rome, has her world ripped apart when someone tries to kill her father, an art history professor at an Italian university. Is she their next target? Cassie sets out to uncover what is happening, only to learn that she is a member of an ancient bloodline that enables her to use the Spear of Destiny--a legendary object that can shape the future. Now running from a secret organization intent on killing those from her bloodline, Cassie must--with the help of some friends--decipher the clues that will lead her to the Spear. Her life--and the fate of the world--depends on it. Summary: Jimmy McClean is a Lakota boy—though you wouldn’t guess it by his name: his father is part white and part Lakota, and his mother is Lakota. 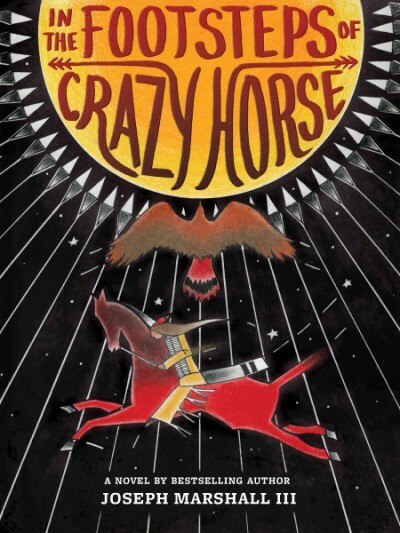 When he embarks on a journey with his grandfather, Nyles High Eagle, he learns more and more about his Lakota heritage—in particular, the story of Crazy Horse, one of the most important figures in Lakota and American history. Drawing references and inspiration from the oral stories of the Lakota tradition, celebrated author Joseph Marshall III juxtaposes the contemporary story of Jimmy with an insider’s perspective on the life of Tasunke Witko, better known as Crazy Horse (c. 1840–1877). The book follows the heroic deeds of the Lakota leader who took up arms against the US federal government to fight against encroachments on the territories and way of life of the Lakota people, including leading a war party to victory at the Battle of the Little Bighorn. Along with Sitting Bull, Crazy Horse was the last of the Lakota to surrender his people to the US army. Through his grandfather’s tales about the famous warrior, Jimmy learns more about his Lakota heritage and, ultimately, himself. Summary: Lucy Wu, aspiring basketball star and interior designer, is on the verge of having the best year of her life. She's ready to rule the school as a sixth grader, go out for captain of the school basketball team, and take over the bedroom she has always shared with her sister. In an instant, though, her plans are shattered when she finds out that Yi Po, her beloved grandmother's sister, is coming to visit for several months -- and is staying in Lucy's room. Lucy's vision of a perfect year begins to crumble, and in its place come an unwelcome roommate, foiled birthday plans, a bully who tries to scare Lucy off the basketball team, and Chinese school with the annoying know-it-all Talent Chang. Lucy's year is ruined -- or is it? Summary: Naomi Soledad Leon Outlaw has had a lot to contend with in her young life, her name for one. Then there are her clothes (sewn in polyester by Gram), her difficulty speaking up, and her status at school as "nobody special." But according to Gram, most problems can be overcome with positive thinking. And with Gram and her little brother, Owen, Naomi's life at Avocado Acres Trailer Rancho in California is happy and peaceful...until their mother reappears after seven years of being gone, stirring up all sorts of questions and challenging Naomi to discover and proclaim who she really is. Summary: Nate Foster has big dreams. His whole life, he’s wanted to star in a Broadway show. (Heck, he’d settle for seeing a Broadway show.) But how is Nate supposed to make his dreams come true when he’s stuck in Jankburg, Pennsylvania, where no one (except his best pal Libby) appreciates a good show tune? With Libby’s help, Nate plans a daring overnight escape to New York. There’s an open casting call for E.T. : The Musical, and Nate knows this could be the difference between small-town blues and big-time stardom. Stay tuned for my Diversity in YA Holiday Guide!